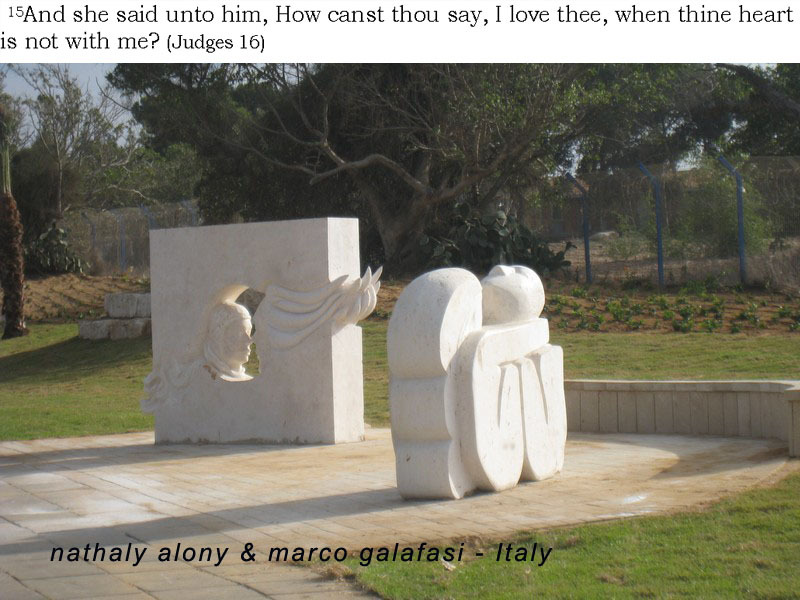 You are invited to submit your proposals for International Stone Sculpture Symposium, Ashkelon "Samson and Delilah" - 7 Couples of artists creating 14 sculptures. When Samson fell for Delilah, a woman from the Valley of Sorek, it marked the beginning of his downfall and eventual demise. It didn't take long for the rich and powerful Philistine rulers to learn of the affair and immediately pay a visit to Delilah. You see, Samson was judge over Israel at the time and had been taking out great vengeance on the Philistines—but that's another story. Hoping to capture him, the Philistine leaders each offered Delilah a sum of money to collaborate with them in a scheme to uncover the secret of Samson's great strength. Using her powers of seduction and deception, Delilah persistently wore down Samson with her repeated requests, until he finally divulged the crucial information. Having taken the Nazirite vow at birth, Samson had been set apart to God. As part of that vow, his hair was never to be cut. When Samson told Delilah that his strength would leave him if a razor were to be used on his head, she cunningly crafted her plan with the Philistine rulers. 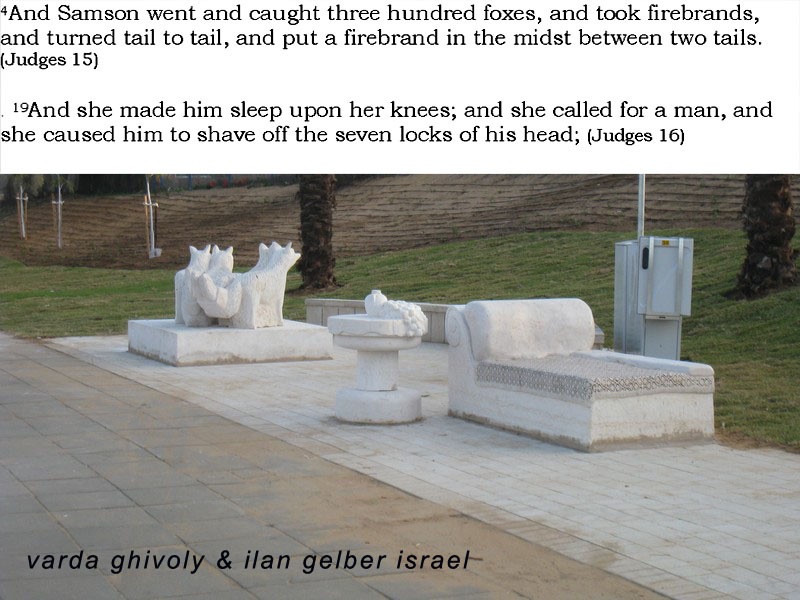 While Samson slept on her lap, Delilah called in a co-conspirator to shave off the seven braids of his hair. Subdued and weak, Samson was captured. Rather than killing him, the Philistines preferred to humiliated him by gouging out his eyes and subjecting him to hard labor in a Gaza prison. As he slaved at grinding grain, his hair began to grow, but the careless Philistines paid no attention. And in spite of his horrible failures and sins of great consequence, Samson's heart now turned to the Lord. He was humbled. He prayed to God—a first—and God answered. During a pagan sacrificial ritual, the Philistines had gathered in Gaza to celebrate. As was their custom, they paraded their prized enemy prisoner into the temple to entertain the jeering crowds. Samson braced himself between the two central support pillars of the temple and pushed with all his might. Down came the temple, killing Samson and all of the people in it. Through his death, Samson destroyed more of his enemies in this one sacrificial act, than he had previously killed in all the battles of his life. During the rule of the Judges, Samson, the hero, went to Ashkelon and slew 30 men there after being deceived by a Philistine woman (Judges 14:19). In the following years he continued to do battle with the Philistines but he also got involved in romantic affairs with several of their women. Ashkelon is associated with the story of Samson and Delilah, and it is easy to believe that the lovely beach was one of their favorite playgrounds. Sculptors wishing to participate in the Symposium shall include previous participation in symposia in their CV. The invited artists will be required to submit their entries: Sketches (2-3) of the proposed sculpture. The proposed works must be original, should represent a high artistic quality, must conform to commonly accepted practice for public art, and may not have any pornographic, obscene, discriminatory racist or hatred contents or connotation. Sculpture design should be such which allows relocation without damage. Application must note the dimensions (height, width and perimeter) for the proposed sculpture. There is a small area of Tel Aviv just outside the walls of Jaffa and within a stone’s throw of the sea which is saturated with the recent history of the Holy Land. It is here that names like Mark Twain, Gustav Eiffel, the German Kaiser, Herzl, Rothschild, Peter Ustinov’s grandfather and Thomas Cook can be linked together. Neve Tzedek ("Oasis of Justice") is the first Jewish neighborhood of Tel Aviv. It was founded in 1887 by Aharon Shlush, a businessman who wanted to escape the crowded Jaffa, 22 years before the city of Tel Aviv was founded. The neighborhood retained much of its old charm, although is has gone yuppie in the past years and became one of the most expensive areas of the city. Neve Tzedek is a cultural and culinary center located next to southern part of the Tel Aviv beach. Each spot of this renovated area is a gem, and a tour of the narrow lanes and winding streets, through its restored homes and shops, is a great experience. Many intellectuals and artists chose to dwell and to create here. The Nobel Prize winning author and poet Shmuel Yosef Agnon, his fellow writer Haim Brener and Nahum Gutman, a famous Tel Aviv artist who captured the spirit of its early days, were all residents, and the works of Gutman can be found in the Gutman Museum in the neighborhood..
One of the most interesting spots in Neve Zedek is the famous Suzanne Dellal Center, one of the most important Tel Aviv theatrical and cultural centers. Suzanne Dellal is the home for Israel’s famous BatSheva Dance Company and BatSheva Ensemble, and catching a dance there is always recommended. There are many small decorative cafes, bars and restaurants in Neve Zedek. Suzanna Café is a restaurant with a nice terrace near the Suzanne Dellal Center. In Michelle bar you will find nice breakfast in the morning and friendly atmosphere, occasionally accompanied by live acts in the evening. Nina is a vegetarian café that has a nice corner location and appetizing organic food and sandwiches. Another dining option is Bellini, a great Italian restaurant with an open kitchen and nice views. The story begins in 1866 when a group of 35 families from the Church of the Messiah in Jonesport in the State of Maine in the United States followed their leader George Adams to establish the Jaffa American Colony. They had arrived on the three-masted sailing barque Nellie Chapin and unloaded their prefabricated wooden houses onto the sea shore. There was a small hill nearby, and it is here that they erected their dwellings ‘to take the lead in developing its great resources’. When they arrived, they discovered that Adams drank heavily and that his claims of rich lands and prosperity were untrue. The colony Mark Twain remarked on a visit in 1967 was ‘a complete fiasco’. Many left and Adams disappeared, but the colony lived on and amazingly some of the houses still stand to this day. Much of their real estate was sold to the newly arriving German Templars in 1869 and the property became known as the German Colony. An Israeli documentary film made about 15 years ago got many of the descendants to open up about their family history and begin to take pride in it. In 2002 Jean and Reed Holmes saved one of the wooden houses from destruction, restored it and opened the Maine Friendship House and Museum. Nearby is the house in which lived Naftali Herz Inber, the composer of Hatikvah. Rolla Floyd who had arrived in Jaffa with a stage coach and opened a branch of Thomas Cook also stayed here. The American Colony is now undergoing some serious gentrification with The Village development nearby constructed in the style of the original dwellings. Next to the Museum on Auerbach Street stands the Immanuel Church. The building dates back to 1904 and its first Protestant congregation to 1858. The strongly built sandstone building is noted for its fine blue and white stained glass windows and fine organ. Over the road, a mission outpost was established which later became an infirmary and a school. Many of the sick Maine colonists were treated there. Plato Ustinov a Russian aristocrat came to Jaffa and established his palace and the Hotel du Park nearby where he housed the German Emperor Kaiser Wilhelm II with his wife Augusta Victoria and it was here in 1898 that he met Theodore Herzl. Baron Rothschild was also a guest in the Hotel du Park. Shai Agnon came here looking for work. Ustinov’s son Jonas is the father of actor Peter Ustinov. The building still stands next to the guest house and heritage centre known as Beit Immanuel. A botanical park was established with Bengali ficus trees, which is still there and under whose shade we sheltered. One of the photographs in the hostel shows orange groves surrounding the colony with the adjacent sea shore and the town of Jaffa nearby. Crossing Rehov Eilat we entered the Tachanah. Hidden for many years behind overgrown trees, the area was rediscovered in 2001 and has undergone a profound restoration prompted by strong support from mayor Huldai. The site was once the Mediterranean terminus of the Jaffa to Jerusalem Railway, the first railway in the Middle East. It was opened to much fanfare in 1892 and immediately proved a success and was a powerful stimulus for the growth of Jerusalem conveying much needed building materials. The 49 acre complex consists of 22 buildings including the historic train station, freight yard, railway tracks and the Templar Wieland’s factory and home. Two of the original carriages stand on the tracks. Careful examination inside the station building designed by Gustav Eiffel reveals an inscription ‘Waiting Room’ in French and outside ironwork inscribed ‘Made in Paris’. The area now combines a mixture of history, commerce and culture, with a good selection of restaurants and bars, boutiques and art. The centre is now a major tourist attraction, and there are plans afoot for significant extensions which will link it to the German Colony nearby. Down the road the is the Susan Dellal Dance Center established on the site of the Alliance, Yechiel and Lewinski school buildings. The main square has orange trees, palms and the original old narrow water channels. Chief Rabbi HaKohen Kook, Rav Kook's exceptional appeal to all sectors of the city may be seen in the picturesque testimony of the painter Nachum Gutman (1898-1980). Gutman, known as 'the artist of early Tel Aviv,' arrived in Jaffa in 1905, and spent his childhood close to Rav Kook's home in the Neve Tzedek neighborhood. "Rav Kook's house was a few hundred steps from our home. His house was enclosed with a whitewashed fence. There was a gate to the courtyard, a small garden inside, and a well of water. Just the sight of the house conveyed an atmosphere of serenity and celebration. Through the open windows of the house, we could hear the sounds of Jews studying Torah. And when the figure of Rav Kook would appear in the opening of the gate, as he readied himself to walk to synagogue — this image at the gate would always take my breath away." "As a child I adored him, because of his beauty, his noble serenity, and his unwavering poise. His persona fascinated me so much, that I would literally follow after him, placing my feet in the footprints that he left in the sand. ... I never met another man like that, a rabbi who knew how to attract people from all sectors and factions. What a figure he was!" Aharon Chelouche, the founder of Neve Tzedek, and the Herzlia Gymnasium. He bought land at the north east side of Jaffa known today as Neve Tzedek. 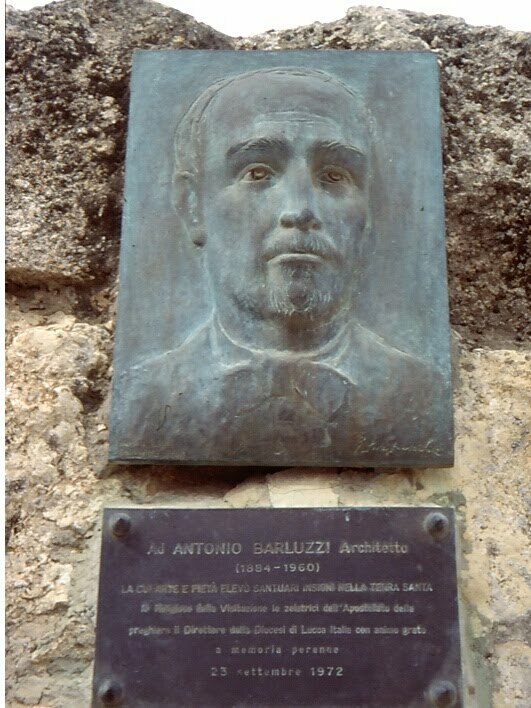 Barluzzi was born in Rome September 26, 1884. He lived with his parents and other siblings close to the Vatican. He lived the life of a simple Franciscan Monk. Barluzzi was an Italian architect commissioned by the Franciscan order to design and build churches atop the ruins of Byzantine and Crusader ones that had been destroyed or fallen into disrepair during the Ottoman period. His work fundamentally shapes the pilgrim experience by defining how we encounter sacred space in the Holy Land. For instance, they're almost all built in the light stone of Jerusalem with an open feeling and bright lighting, and contain mosaic panels with healthy dose of blue. He started his career as an architect spending several years working with his brother, Giulio, on building projects in the Middle East. The first project in Jerusalem was the 100 bed Italian hospital on St. Paul (now Shivtei Yisrael) Street. His first two Franciscan commissioned assignments were to build basilicas in Gethesemene and Mt. Tabor (1919). A whole succession of works followed. For the Custodia di Terra Santa in 1924-5 he built the little church and the hospice of the Good Shepherd at Jericho. In 1928-9 he carr ies out restorations works at the Flagellation in Jerusalem; in 1933-7 in two sessions he carried out building work on Mount Calvary; in 1952-3 he built the Shrine of St. Lazarus at Bethany; in 1954 the Shine of the Shepherds near Bethlehem; still in 1954-5 the Dominus Flevit on Mount Olivet, and he restored Bethphage. 1. The Church of All Nations in the Garden of Gethsemane. 2. The Church of the Transfiguration, Mount Tabor. 3. The Church of the Hospice of the Good Shepherd, Jericho. 4. The Church of the Flagellation, Jerusalem (restoration). 5. The Church of Visitation, En Karem. 7. The Church of St Lazarus, Bethany. 8. The Church of the Angels, Shepherds Fields, Bethlehem. 9. Dominus Flevit, Mount of Olives. 11. A School for gir ls in Jericho. 12. A hospital in Amman, Jordan. 13. The Kerak Hospital, Jordan. 14. The Church of the Beatitudes, Galilee. 15. The Armenian Catholic Patriarchate, Beirut. 16. Churches and other related buildings in Amman and Madaba, Jordan. 17. The Parish Churches in Beth-Saur, Irbid and Zerka. 18. A new house for the Carmelite Fathers of Haifa. 19. The Church at Mount Carmel. 20. The Convent of St Antony, Jerusalem. 21. The Ethiopian Monastery (restoration). 22. The Italian Legation premises at Teheran (restoration). 23. Terra Santa School, Jerusalem. 24. The Greek Church of the Holy Face and St Veronica, Jerusalem (restoration). In 1958 he learned that his design for a new basilica in Nazareth had been rejected. On the night when he heard this bad news he suffered a heart attack which brought on cerebral deafness and pulmonary emphysema. Few Buildings Escaped Harm, and Others May Collapse -- Nathan Straus Sends 5,000 Pounds. Thousands were left homeless by Monday's earthquake, in which in Palestine alone hundreds were killed and 1,000 were injured. Though expert examination is still to be made, it is believed that no irreparable damage was caused to historic buildings, but hundreds of private houses will require extensive repair or rebuilding. In fact, very few buildings of any kind entirely escaped. The "Dome of the Rock" it is now stated was badly shaken and the many repairs of recent years were rendered useless. Serious injury to the Government house on the Mount of Olives rendered it unfit for habitation, and the tower is in danger of collapse. A Russian maid servant was killed in the building by falling stones. The slender tower of the Russian building still stands, though there are fears for its safety. Serious cracks appeared in one minaret of the Haram-es-Sherif and the Chapel of the Ascension on the Mount of Olives has been badly damaged, the upper part of its minaret having broken off. Banked portions of the Jericho Road have shifted slightly in parts and it is somewhat unsafe. The Church Missionary Society school, southwest of the Old Wall of Jerusalem, had much damage done to its walls. In the Basilica in Bethlehem there is a crack opposite the Armenian Door and many in the walls of the Armenian Convent. The Armenian Church of St. James in Jerusalem apparently was unhurt, but most of the arches were cracked in the monastery. The top of the minaret at David's Tower was broken off and some stones were displaced in the other tower. The Hebrew University is estimated to have suffered many thousands of dollars damage and the well-built new Jewish quarter north of Jerusalem was badly shaken. So violent was the shock in certain areas that many persons were thrown from their beds. At the Russian compound the shock was so sever that three of the columns supporting the cupola of the Russian church fell, leaving the cupola precariously supported by the four remaining columns. In the Beth Israel quarter the Bagdhdadese Synagogue collapsed. The Winter Palace Hotel in Jericho fell to the ground. Three Indian tourists were killed and many other guests were injured. The loss of life was serious in the villages around Jerusalem, such as Ain Karim, Lifta, Silawan, Yalo, Ramleh, Abu Dis, Beth Iksa and Bir Zeit. In Semakh and Acca the mosques were badly damaged. In Amman, where ten were killed, the British representative's house and the Prime Minister's house were destroyed. At Es Salt eighty-five were killed and 180 were injured. Many persons slept in the open last night, some for fear of further shocks, and other because their homes had been destroyed by the earthquake. The Samaritan community at Nablus suffered greatly. Their synagogue shows dangerous cracks. All of the houses collapsed or are in danger of collapsing. The community is now living in tents in the cemetery of the hillside. Four hundred bodies have been recovered from the debris of the earthquake Monday afternoon in Palestine cities and villages. The loss suffered by the public and private buildings in the earthquake was set at $1,250,000 in a tentative estimate made today. According to the list compiled by Authorities, the number of injured was placed at 450. The list shows that eight were killed in Amman, the capital of Transjordania, and eighty-five in Es Salt. No casualties were reported among the Jewish population in the country. Thousands of families all over the country spent last night in the open air, fearing a repetition of the earthquake. Not a house in Jerusalem or Hebron is without some damage. 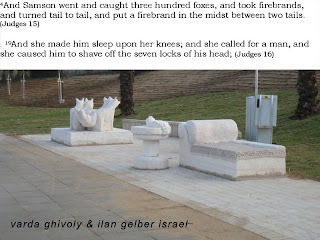 Two synagogues, one in Jerusalem, the other in Tiberias, were destroyed. In several Palestinian towns the Moslem mosques and the Government office buildings were damaged. The house of the British representative in Amman, Transjordania, was totally destroyed. The Church of the Holy Sepulchre, as well as the Greek Choir Chapel and two large domes are damaged. A message of sympathy was received by Colonel Symes, Acting High Commissioner, from Lord Plumer, the High Commissioner, who is now on vacation in England. A leading Moslem architect, who has inspected the temple area, estimates that the total damage by the earthquake there at less than 1000 Pounds. He denies the report that the Dome of the Rock, or Kubbet Es-Sakhra has been damaged by the quake; he says that a slight crack visible in the mosaic work is probably due to earlier deterioration. The Daily Mail's Haifa (Syria) correspondent says that 500 persons were killed in the earthquake in Palestine and Transjordania and that more than 700 houses in Jerusalem and the surrounding districts were damaged. These included the Greek convent and the Patriarch's residence on the Mount of Olives. A minaret fell while a sheik was reciting prayers, killing him. The damage to Jerusalem is estimated at about 100,000 Pounds. Thousands of watermelons rolled from a warehouse at Haifa owing to the vibrations of the earthquake and while some persons ran for safety, others chased the melons and feasted. Pope Pius has been deeply grieved by the news of the earthquake disaster in the Holy Land and has sent instructions to the Patriarchs at Jerusalem concerning relief work. The Pontiff has made many inquiries concerning the gravity of the disaster. Twenty-five were killed and thirty-eight injured in the Jerusalem district earthquake on Monday, according to first reports on the disaster received by the State Department from Oscar S. Heizer, the American Consul at Jerusalem. No Americans were killed or injured so far as known. With reports from several districts missing, Heizer said casualties were summarized as follows: At Ramleh-19 killed, 28 wounded. At Nablus-15 killed, 250 wounded. At Ramallah District-3 killed. At Hebron-3 killed. STRAUS CABLES 5,000 Pounds AID. Zionist Women Send $40,675 for Palestine Quake Relief. Nathan Straus cabled 5,000 pounds to Jerusalem yesterday for the relief of earthquake sufferers. The Hadassah, or Women's Zionist Organization of America, sent $40,675 for the same purpose. The Hadassah Medical Organization has a staff of 550 persons. Dr. E. M. Bluestone, former Assistant Director of Mount Sinai Hospital, is Director of the organization. The Hadassah hospitals, clinics and infant welfare stations are conducted according to scientific American standards. Meet at the entrance to Ashdod Port at 8 AM and drive directly to Mount of Olives above Jerusalem for a magnificent view of the Old City. Walk down the Pilgrim's Path (1/4 mile)stopping at Dominus Flavit Chapel to the Garden of Gethsemane and the Franciscan Basilica of the Agony. Enter the Old City at Zion Gate visiting the Armenian and Jewish Quarter including the Western or Wailing Wall - the sole remnant of the 2nd Temple destroyed by the Romans in 70 AD). Walk into the Muslim Quarter and onto the Via Dolorosa (the Way of the Suffering) and observe the 14 Stations of the Cross to the Christian Quarter and the Church of the Holy Sepulchre the site of the last 4 Stations. AFTER QUICK, LUNCH WE WILL ASCEND TO THE TEMPLE MOUNT TO VISIT THE HOLY SANCTUARY THAT INCLUDES THE SITE OF THE FIRST AND SECOND TEMPLES AND TODAY THE DOME OF THE ROCK AND AL AQSA MOSQUE. 1. Stop at corner with HYWAY #1 across from Jaffe Gate with back to City Hall. Talk about 1948 War for Independence - Armistice Map - Moshe Dayan and Abdullah el Tell, Mendelbaum Gate, house in Beit Saffafa that was cut in half. Take first right into courtyard off of Shivtei Yisrael to see French hospital courtyard. Give background of Crimean war - roles of French, British, Turks and Russians. Go to #13 Shivtei Yisrael to see the Russian Pilgrims' Center - across from Lifeline for the Old. Russians were truly pilgrims - walking from Jaffa to Jerusalem and from Jerusalem to Jericho. Mention the Grand Due Constantine who built the Center. Point of were the ecclesiastical center was located in the alleyway to the left. Explain about the White and red Russian churches. Further down the street is the Russian womens pilgrim center. Point of the double gabled roof. British made this a prison. Zionist prisoners have become heroes. No one hung here but two themselves up. Speak about about Etzel, assination of lord Moyne. Go down stairs 2nd level is rotary park in Musrara. Musrara become a poor neighborhood for the poor Jewish immigrants from the Middle East. From 1948-67 it was considered undesirable and danger area. Key money system of property ownership. After1967 this becomes a mixed neighborhood made up of both rich and poor Jewish residents. The building at #23 Shivtei Yisrael is an Ethiopian Orthodox church property. Further down we come to the St Paul Church built in the Neo-Romanesque style in 1873 by the London based Church Mission Association. The language of worship was Arabic. Today the church is under the administration of the Finnish Evangelical Lutheran Mission - headquartered across the street from the church. Further down the street at the corner with Nivaiim (Prophets) St., we come to the lovely resident Mahanayim House [source of the name comes from Genesis 32:2] house. It was built in 1885 as a private residence for the German banker Jacob Frutiger - a Swiss missionary. This building become the Evelina d Rothschild Girls School in 1896 - lessons first taught in French, later in English and after Israel's independence in Hebrew. The British High Commissioner Plumer had is residence here and later the home of the Zionist leader Menachem Ussishkin. Today the Ministry of Education houses some of its offices here. Further down the street we come the very impressive Italian Hospital designed by the Italian architect and Franciscan clergyman Antonio Barluzzi - his first of many projects in Israel. During WWII the Sisters were interned at the Austrian Hospice in the Old City and the building was taken over the the British Royal Airforce as their HQ here. Notice the huge mezuzah that was place here by Minister of Education Zuvulum Hammer. Turn right at Paz gas stations and walk 50 meters enter Rumanian Orthodox Church. Across the St. is the Polish guest house. You can look down to the end of Shivtei Yisrael where the Mendelbaum Gate was located from 1948-1967. This area is now an Jewish orthodox section of Jerusalem. At this point the tour ends.